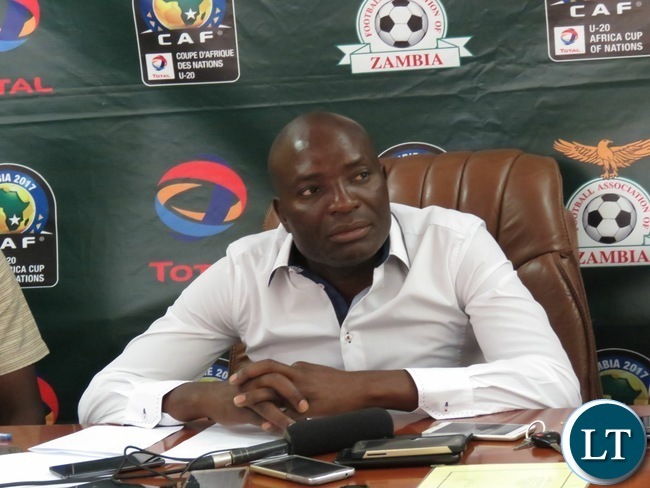 Wedson Nyirenda has named his final 23-member Zambia team that will battle Nigeria on October 7 in the two sides penultimate 2018 FIFA World Cup Group B qualifier away in Uyo. Two regular veterans continue to be overlooked by Nyirenda in particular the TP Mazembe duo of Rainford Kalaba and Nathan Sinkala who have yet again both been snubbed. The duo was earlier also overlooked for the September 2 and 5 Group B dates against Algeria. Overall, Nyirenda has kept faith in the same players who served him in well in the 3-1 home and 1-0 away Group B victories over Algeria last month. Midfielder Edward Chilfuya who was dropped for the Algeria engagements due to an administrative problem is back in the team. The 2017 FIFA U20 World Cup quarterfinalist and 2017 U20 AFCON winner is set for his first senior cap against Algeria. Meanwhile, Zambia leaves for Ghana this Sunday to hold a four-day transit training camp on their way to Nigeria. All 11 foreign-based players will link up with their 12 home-based compatriots in Accra on Sunday and Monday. Zambia is 2nd in Group B and three points behind Nigeria on 7 and 10 points from four games played. Third placed Cameroon and bottom of the log Algeria are out of the race on 3 and 1 point respectively. Didnt fashion get a red card? is he eligible? Fashion missed the second leg in Algeria. That was all he needed to miss. Now he is back. If you were a computer it would cost a lot to update you. If you have nothing to say please with due respect just shut up.this is not politics its a game that benefit everyone. Good player will always be looked by everyone. Good choice coach Nyerenda just as I thought players deserve chance to play competive games so hat they gain experience. Sorry he is NOT a Zambian. This is a national team boyi. You asked about Uyo… Are you not in Nigeria? On this one, coach you are wrong. Many people didn’t know that Kalaba could not play against Algeria due to yellow card. For Nigeria, you sure need him. North African and Ghana play same style with Zambia. Nigeria is physical, you needed Maestro and Sinkala. Lets pray for the best. @Shooterz, Fashion already served his suspension. He missed the return match against Algeria in Algiers. WE WISH THE BOYS GOOD LUCK. WORK AS A TEAM AND NOT INDIVIDUALS. NIGERIA IS TOUGH AT HOME, WORK FLAT OUT THROUGHOUT 90 MINUTES ALTHOUGH THE CHANCES ARE SLIM. HOWEVER, GOOD LUCK THE COACHING TEAM AS WELL. But people why asking about fashion sakala red card you mean you don’t know the rules of football well and the boy is going to start the game. Uyo is capital of akwa ibom state in Nigeria. .We going there to collect 3 points, I rest my case. This dumb coach has again left out Rainford Kalaba. We needed him because this GAME is the biggest so far. I love my country but I don’t see us beating Nigeria with this BLUNT front. Comment: jacob mulenga was supose to play this game, the man is a manchine.Don’t forget those players becoz u have seen these young ones.nigeria have mikel and iwobi but as we have so many players the likes of mulenga j,emmanuel mbola,kalaba,sinkala,nkausu,kabaso chonga 2mention just a few.anyway wishing u all the best. The team looks to be fine though the coach has errored by leaving Master Kalaba again because west african teams need opponents of Kalaba’s calibre. In life we should learn to forgive. We should learn from the past where Kalusha nearly destroyed football in Zambia because of same mentality of no forgiveness. All the best boys,but chi nyelenda should stop segregation when picking prayers bcoz it’s combination of zanaco and zesco.any way it’s maybe bcoz he coached them. All the best the chipolopolo boy!!!!!!!!!! Comment:coach just do away with the 2012 Guy’s completely.